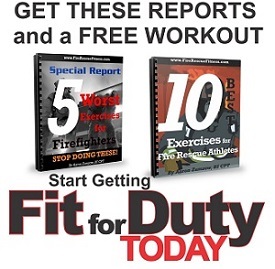 Improve your performance on (and off) the fireground with this exercise. Shoulder and upper body strength are an essential fitness trait required on the fire ground. Hoisting ladders, hoseline, carrying equipment all require strength of the shoulders AND good core stability to support the movement. Yet, I still see a lot of fire rescue athletes doing isolated shoulder exercises (from a seated position). So, today I wanted to give you an exercise and a that actually comes from the king of bodybuilding…. Arnold. He created a shoulder press variation that effectively worked all three “heads” –front, middle, and back– of your shoulders. And, by changing the stance and performing the movement from a standing position it will definitely help with your performance on the fireground. FRF “Arnold” Press- Stand holding a pair of dumbbells in front of your shoulders, with your palms facing your body and your elbows in tight to your sides. Brace your core (like you are about to take a punch) and squeeze you glutes. Push the dumbbells straight overhead while slowly rotating your palms. When your arms are extended your palms should be facing forward. Pause at the top and then slowly rotate the dumbbells back to the starting position. Use this exercise during your next FRF workout. Start with light weight and higher reps and make sure to always control the weight. Try to change your stances for more of a challenge. Let me know if you have any questions (you can email me by clicking here).